Newport Beach, which lies in the coastal center of Orange County, is your quintessential SoCal beach city: an eclectic mix of fun-filled beach life and high-end lifestyles characterized by yacht-lined harbors and ocean-front luxury mansions. Built in 1988 by the late legendary Canadian architect, Arthur Erickson, the Balboa Beach House is an architectural treasure. This contemporary steel and glass two-level home occupies a sprawling area of 4000 square feet, and comprises a kitchen, family room, and a large living room which include areas for dining, entertaining, and lounging on the lower level, and five bedrooms on the upper level. The main level patios are extensions of the interior living spaces, and are separated by sliding glass doors which, when fully stacked, leave corners and walls open. This home sports a contemporary design by Gonterman Constructions. It features a modern kitchen, living space and three bedrooms. The living space is designes as an open plan that extends into a view of the Back Bay, with the two spaces delineated by frameless sliding glass doors by Cover Glass USA. The interior décor of the house is a palette that includes multiple hues of blues and greens, with splashes of orange to complement the landscape of the home’s picturesque location. 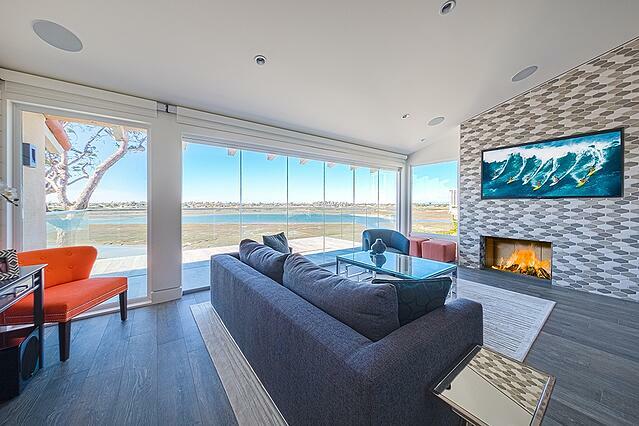 This beachfront home on the Lido Isle overlooks the yacht harbor of Newport Bay, which offers a gorgeous view from the living room. 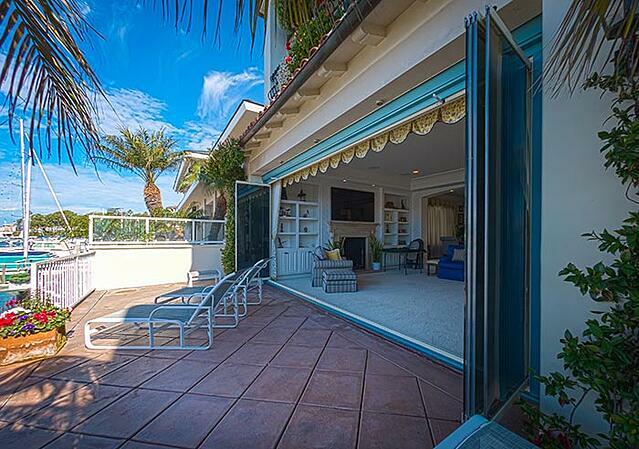 The space opens out to a tiled patio that leads down to the marina. Cover Glass USA’s frameless sliding glass doors stack on both ends to create a blended interior exterior world. This family residence in Channel Place, Newport Beach has three bedrooms and three bathrooms. The open living space, featuring hardwood floors and a cozy fireplace, opens all the way to best enjoy the view. 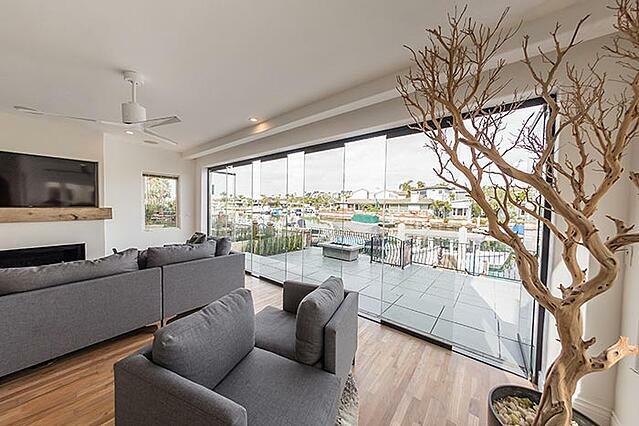 The living space benefits from the natural light streaming in thanks to sliding frameless glass doors. Newport Beach is home to hundreds of gorgeous beachfront properties, and this here is a tiny selection of those. Nevertheless, we hope you enjoyed this peek into Newport’s finest houses. To see more breathtaking houses, visit our gallery.